Peters’ lead shrinks from 954 votes on Friday to 795 votes. This race is far from over. This race, too, has tightened considerably. Peed held a 1,093 vote lead as of Friday. That figure has shrunk to 601 votes. This is the race between the longtime prosecutor, Peed, and the birther attorney Kreep. A black eye for all of San Diego County should Kreep creep back into the lead. Yet another race that has tightened as the last ballots are counted. Bob Filner has closed the gap ever so slightly from 3,596 votes to 3,330 votes. More on Bob Filner’s campaign tomorrow. 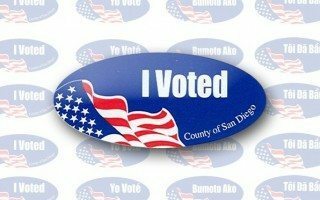 For all of last Tuesday’s most up to date election results, visit www.sdvote.com.